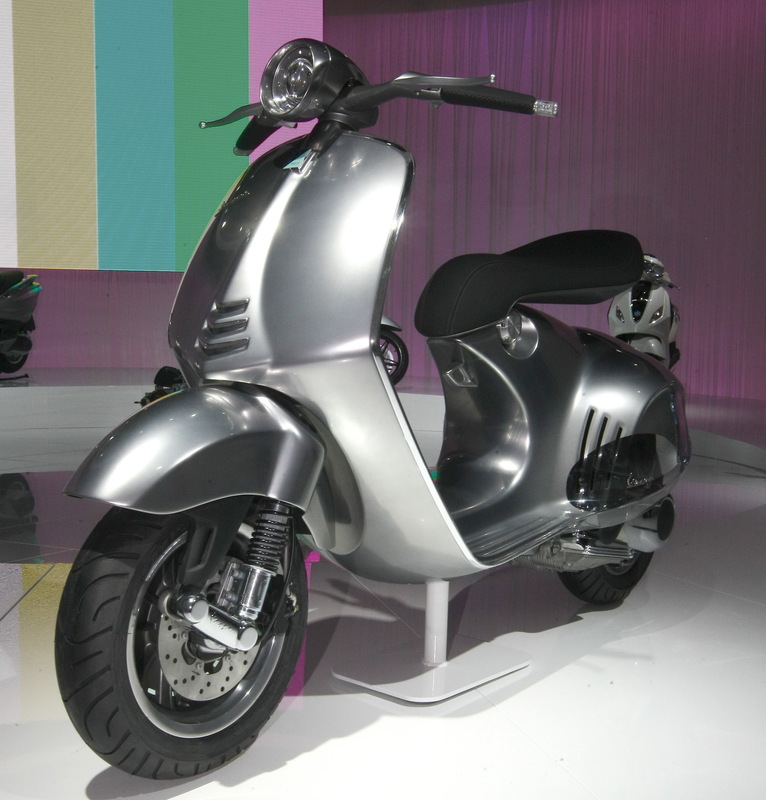 After maintaining a steady lineup for the past few years, Vespa has stirred things up for 2013. No, the radical new 946 won’t be here for another year or more, and no Vespa hasn’t slipped their new 3-valve 150cc engine into any North American models, but at least there’s something to get excited about. Consider 2013 to be the prequel, the warmup, to the bigger news announcements that lay in the years ahead. back are the collectors ‘V’ variants of the LX and GTS -known as the LXV and GTV respectively. So what’s new? Well, a few tweaks, some new colors and a pretty neat ’Sport SE’ trim version of the S and GTS. Vespa logos on the handgrips and floorboard. The instrumentation has also been revised, with the S boasting classy blacked out and easier to clear gauges, while the LX 150 enjoying a freshening of the instruments style. Vespa has made quite a few changes to their color offerings for 2013. You can delve into all the color details over at Vespa’s website and I’ll highlight the main ones here. The Vespa S is no longer available in titanium and Satin black has become exclusively available on the Sport SE variant of the S. The LX gets a new Aquamarine option and black is back. The upscale LXV trades Portofino green for a new ‘Sienna Ivory’ shade. The larger GTS scooters also get new clothes. The regular GTS 300 trades Plum for Bronze, while the Super trades Titanium for Dragon Red. The new GTS 300 Super Sport SE comes in exclusively Satin black, like it’s S counterpart. Also like it’s smaller sibling, the GTV trades its green pigment option for a new ‘Sienna Ivory’ tint. The Sport SE variants of the S and GTS are undoubtably the biggest news for 2013. These limited edition Vespa’s claim to amplify Vespa’s sport spirit using a minimal aesthetic and high performance. While ‘high performance’ might be a bit of a stretch (there’s no performance tweaks at all), Vespa has created a tasteful aesthetic. The Satin black paint (and wheels) look great with the red (shock coils) and white (seat piping) accents. The ribbed seat adds a sporty element too. While the checkered (S 50/150) or ‘Super’ (GTS) graphics on the flanks might not have been necessary, they are the most obvious identifier of these limited edition models. Pricing for the Super SE adds $100 (S 50/150) or $200 (GTS) to the price, which is quite reasonable for even just the seat alone. Kymco Canada has stepped beyond their 2012 tally of 10 models and has announced an all time high of 13 scooters for 2013. That’s more scooters to choose from than all of the Japanese makers combined - quite a few more. The biggest splashes for 2013 are the new Movie 150 and Like 50 & 200 machines. The Movie 150 is Kymco’s newest mid-sized sports scooter, while the Like 50 and 200 are Kymco’s most direct take on the ionic vintage scooter style. The Movie 150 was recently announced for the USA market as well, so you can read more detail now in the Movie 150 section. Like 50 uses a potent 2-stroke motor, so power enthusiasts and larger riders can rejoice. The larger Like 200 contains a 160cc 4-stroke motor, which really expands the usefulness of this scooter beyond the city. Between the New Sento 50 & 110 and the new Like scooters, there’s a retro styled Kymco in everyone’s desired power range. Appearing alongside these three new models are a revised Xciting 500 and the rest of Kymco’s 2012 offerings which have all gotten the nod for 2013. With a total stable of 13 scooters, Kymco is marketing a scooter targeted at nearly everyone. For more info on these new models, have a look at YouMotorcycle.com’s first look. It appears one of the hallmarks of the maxi scooter scene has reached the end of its run - at least in its present form if not permanently. In recent days, Suzuki USA announced the bulk of their 2013 line, with the Burgman 650 (AN650) silently absent. The newer Burgman 400 is present, but the biggest Burg didn’t make the list. Suzuki has developed a new generation of the Burgman 650 which is headed for showrooms overseas, but so far Suzuki USA has made no indication of importing this model. The North American spec Burgman 650 hasn’t been updated since its 2004 introduction (and it went on sale for 2002 elsewhere), so it’s already been on sale for over a decade without a significant update. That’s a long time, but certainly nothing close to a record. While it’s still a bit early for an obituary, it seems unlikely the Burgman 650 will be back in its present incarnation. Either Suzuki will usher in a new decade of maxi-scooter awesomeness with a fresh generation, or the end has finally come. On a completely different, Honda’s PCX is now coming to Canada. For years Kymco has boasted the most populous scooter lineup in the USA and 2013 appears to be no exception. Occupying Kymco showrooms for 2013 will be a total of 14 different machines. The quick breakdown is four 50cc’s, one maxi scooter and an impressive tally of nine mid sized scoots (110-300cc). Before delving into discussion on the new models, a moment of reflection is warranted to salute the departure of the original People scooters from Kymco’s lineup. Outlasting any of their contemporaries, the People 50 and 150 were introduced in 2001 and 2002 respectively - the former being a member of Kymco’s debut lineup in the USA. After more than a decade on sale in the USA, these two final members of the People family are headed for the great gymkhana in the sky. Also joining the People 50 & 150 out the exit door are the Yager 200 and retro Sento 50. The outgoing Sento 50 is being replaced by a pair of new retro scooters badged as the Compagno 50i and 110i. This stylish model was actually introduced a year earlier in Canada as the New Sento 50i / 110i, so you can read some more in depth thoughts on it now. The Compagno slots in as Kymco’s premium offering in the retro scooter niches with MSRP’s of $2599 (50cc) and $2999 (110cc). At $300 more than the Like 50, the Compagno 50 delivers about 10% better milage and power thanks to its 4-valve, fuel injected mill. Also for 2013 is an entirely new nameplate - the Movie 150. Resembling the Super 8 150 more than anything else, the Movie 150 is a more subtly sporty model than the flashy Super 8. The Movie 150 boasts some neat features like disc brakes front and rear and dual rear shocks. Finally, the Xciting 500 has been redesigned for 2013 and is now called the Xciting 500 Ri. It boasts fresh styling, new conveniences and a new generation of Bosch ABS. 2013 YAMAHA'S: ZUMA'S RETURN & VINO 50 GAINS F.I. Yamaha USA and Yamaha Canada made concurrent press releases this past week to announce some early 2013 scooter models. While not likely their complete 2013 lineup, this early release heralded the return of the Vino 50 and both Zuma’s - 50 and 125 - as 2013 models hitting showrooms this summer. fuel injection for the first time. This update was only fitting as the new for 2012 Zuma 50 and the departed C3 used the same core motor but with fuel injection while previous iterations of Vino 50 (2006 - 2011) made do with a carb. While lucky to get fuel injection, the small Vino 50 didn’t fare as fortunately in the paint booth. The lone color option for 2013 is a cream-ish shade being called Vanilla White in the USA and Yellow-ish Gray in Canada. The Zuma’s didn’t receive any mechanical tweaks like the Vino, but they do get some nice color choices for 2013. The 125cc Zuma is going to be offered in Dynamic Blue (USA) and Vivid Metallic Red (Canada) alongside the more standard Matte Black option (both countries). The smaller Zuma 50 is available in Matte Black, Heat Red and Yamaha Blue (Canada Only). Heat Red is likely to be a popular option. To make up for missing 2012, the Vino 50 is rolling into showrooms now, while the Zuma 50 lands in July and the Zuma 125 in August. The newest member of Piaggio’s popular BV series has landed in American showrooms. The BV350, or Beverly Sport Touring 350 as it’s dubbed internationally, was unveiled last fall at the 2011 EICMA show in Milan. At the time, Piaggio hinted towards a North American release and confirmed that in March when they announced it as an early release 2013 model. Piaggio expected to have this scooter in dealerships during May, but the intrepid BV350’s have slipped thru the border and are now landing in American showrooms. The BV350 uses the same core frame as the departing BV300 (and BV250 before that), but Piaggio has made a huge list of great updates. The 330cc motor is new and now boasts both fuel injection and 4-valves. Power is up to 33.3 HP (vs. 24HP for the 250), which is just 6 ponies shy of the heavier BV500. With the bump to 330cc comes a 10mph top speed boost to 90mph. styling has also been reworked for 2013. There’s a lot of new bits (rims, mirrors, blinkers) and a number of components have been blacked out or darkened for more aggressive ‘dark knight’ slant. The mahogany toned saddle is also a great touch. Colors for 2013 are Shiny Black and Matte Silver. Pricing is quite reasonable at $5499. Check out the Piaggio BV Series page for complete info on the BV350 or browse the first ride report from Cycle World. MP3 CITY 300 TAKING OVER IN 2013? PIAGGIO REPLACING THE MP3 250, 400 AND 500 WITH NEW MP3 CITY 300? Rumour has it that Piaggio (USA & Canada) is scaling back their MP3 line from three models to one for 2013. Starting second quarter 2012, Piaggio is no longer accepting dealer orders for the soft styled MP3 250 and 400, as well as the bold MP3 500. This move has speculation spiking amongst fans and dealers about the future of the MP3 line. While popular in many markets, the MP3 has received only a luke warm response in North America. There has been some speculation Piaggio is axing their 3 wheeled line entirely, but most sources believe [see comments] they are scaling back to one model….the new MP3 City 300. The City 300 was unveiled in late 2010 overseas under the awkward name ‘MP3 Yourban’ which Piaggio has wisely abandoned for America. One Piaggio dealer claims that Piaggio USA is training mechanics on the newest MP3 now, in preparation for a late summer launch. Both the styling and performance of the MP3 City strike a compromise between the currently diametric range of MP3 models. The styling is less cheeky than the smaller MP3’s, while less over the top than the testosterone styled MP3 500. This sharp styling joins the new Beverly Sport in finding the handsome middle ground Piaggio has been missing lately. The 300cc fuel injected motor falls on the smaller side of MP3 engine palette, but the City 300 makes up for it by shedding some pounds and inches of its own. The whole premise of the City 300 was the MP3 smaller, lighter and more nimble. Piaggio feels this better suits the MP3 to the city, but it actually makes the MP3 more fun to drive on any road. While not confirmed yet, we’ll likely see a press release from Piaggio USA in early to mid-summer about the future of their MP3 line. Some fans are have got their fingers crossed that Piaggio will toss in the larger 350cc motor they’re using in the BV Sport 350.